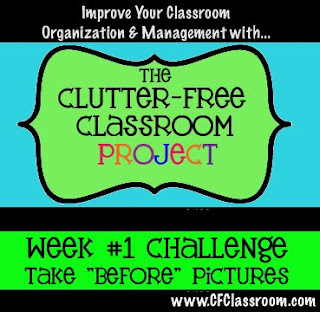 When I saw this "Project" from Clutter-Free Classroom, I knew it would be right up my alley. Not only because I hate clutter....and I'm rather OCD about certain things....but also because my classroom had somehow, while I wasn't looking become full of clutter! Clutter = Chaos in my book and chaos isn't good. 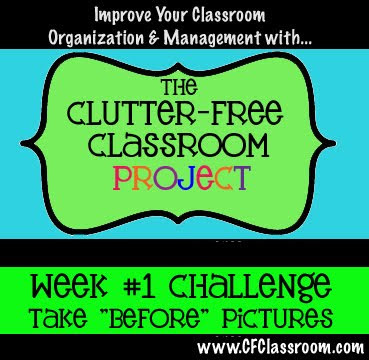 Take BEFORE pictures of your classroom - from all angles. Get all the awful clutter documented forever on film...or memory stick. I did that and was it ever painful to then sit at my computer and look at some of the messes with a different eye. But...never fear! I will prevail with the encouragement and kick in the tush from this Project!!! If you would like to join in, check out this blog post. Thanks for linking up! That closet has such possibilities. I would love to have that space. Have a great weekend! I understand the feeling of looking at the clutter in pics. It makes you face what others must see. Good luck getting that closet under control! Your room looks great. It's just the closet that needs help. Jodi's right the possibilities are endless. I can't wait to see what you do to your spaces. I wished I had a big closet like you do. I'm sure I will get great ideas from you and others.